Since December, seven Lakota teenagers have committed suicide on the Pine Ridge Reservation. The youngest to die in the spate of suicides was 12. The recent deaths underscore the importance and urgency of developing solutions to the social ills afflicting the reservation and has plunged a community into grief and a period of reflection and searching for answers. Pine Ridge is struggling with a youth attempted suicide rate that is seven to ten times higher than the national average. 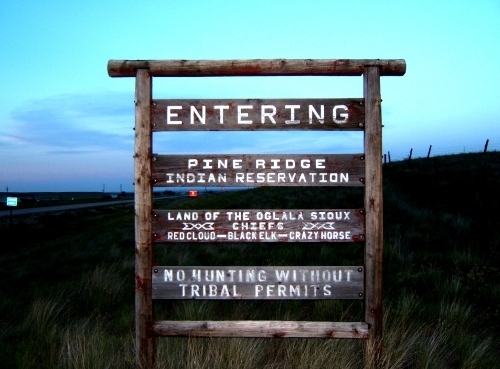 Like many other Native American Reservations, Pine Ridge has high levels of poverty which results in poor health and education. Native Americans between the ages of fifteen and twenty-five commit suicide at twice the national average and have the highest rates compared to any other population group in the United States. The unemployment rate of hovers around 80 percent. Members of the community and officials described an environment were poverty and lack of prospects to better life has robbed the community of hope. “Why so young?” she said. “Why do these kids think there is no hope? Well, look around,” Yvonne “Tiny” DeCory told the AP. DeCory has worked in the field of suicide prevention for more than 30 years. Pine Ridge residents have some of the worst outcomes in terms of life expectancy in the nation, but much of it stems from the trauma inflicted by years of abuse by the state government and a lack of funding and attention from the federal government. The Lakota People’s Law Project has been advocating for a comprehensive grant program for tribes that focus on providing vital infrastructure in the areas of housing, health, education and particularly child and family services. LPLP was instrumental in securing a federal planning grant that will allow the Oglala Sioux Tribe the means to begin building their own child and family services programs. Those programs, intended to bypass South Dakota state institutions that have willfully violated the Indian Child Welfare Act, will also serve to provide support to at risk teenagers. A program called Sweetgrass, one of the Reservation’s initiatives, will draw on traditional tribal values to educate the community on how to notice and respond to suicidal people. The Lakota people are best positioned to address the real problems in their communities but the federal government must empower them to do so. It is not as though highly positioned members of the executive branch aren’t aware of the depth of the problems. Michelle Obama recently issued a statement saying more needs to be done. “You see, we need to be very clear about where the challenges in this community first started. Folks in Indian Country didn’t just wake up one day with addiction problems. Poverty and violence didn’t just randomly happen to this community. These issues are the result of a long history of systematic discrimination and abuse,” Michelle Obama said. See the full Associated Press story here. The Christian Science Monitor has a story here. Glad this tragic problem is being addressed. Hoping one of the solutions could be the micro loan program..which has worked in some poor communities…to help people start a small business. As Native American style fabrics and jewelry are in style, perhaps some can target fashion designers with wholesale GENUINE Native American designed fabrics. Perhaps some can target the retail market such as on Etsy, eBay with GENUINE Native American designed and made clothes/purses…and also the popular 18″ girl doll market with GENUINE Native American designed and made apparel and accessories! How about clothing and other items made from hemp grown on the reservation? What legal hurdles exist to a hemp.industry? Hemp is legal on the ogalala Rez. It’s in the constitution that growing and selling hemp is legal…. Saddest thing I’ve heard in a while..It takes me back to the original settlers and the army/Government. I mean How dare those Indians be on our land before we got here? If Michelle Obama knows that more needs to be done about it, how much does the president know about “these issues?” Why is South Dakota the only state that he has not visited during his time as President of the United States? Stop pumping them full of hatred and all that was taken from them.by the bad ‘Colonials’. Let them have a future without self pity and look forward to it rather than indoctrinating them with a past that is gone and just wasn’t as marvelous as it is hyped to be. In other words, stop playing Indian. Join the world. Very sad, such a tragedy. These American Indians see ‘NO WAY OUT’~ no purpose to their lives. Very much needs to be addressed by the Representatives of this state.